Two thinktank reports (here and here) out in the last week have proposed using increases in taxes to fund cash distributions in the UK. Both of the economists who wrote those reports and did the number crunching have also said that UBS is essential. One reaction to these and other proposals for cash distributions is to suggest that we should have both UBS and UBI. And that’s a good question to ask because too often we set up dichotomies when reality demands junctions. But in this case we have an externality that has to be accommodated: tax space. When we think about how to transition to a 21st century future that will deliver a larger life for the ordinary person in a sustainable and resilient society we have to pay attention to what we think the “people” in this imagined future will be willing to contribute to the social effort. Our best guides for that externality are history and what exists today. UK history shows us that we have never, as a country, agreed to assign more than 44% of total income to social purpose, even when we were at war. Today we are at 39% GDP. And there is a growing body of work that proposes a “Goldilocks” zone of total taxes as a percentage of the economy that falls somewhere between 40% and 49%. There are large and developed countries with tax takes higher than 50%, of which France is the best example, but the gilets jaunes protests there suggest that this might not be generally acceptable in the long term. A key reason why tax rates may not exceed half of national income is the sophisticated and complex nature of our modern urban societies that are completely dependent on a large array of highly specialised functions which require us to motivate and retain an army of specialists to keep them running – witness the recent long power outage in Venezuela. If we accept that there is only a certain amount of fiscal space within which we must fashion our solutions for a prosperous society, then we are forced to prioritise. What is the best way to use the available additional taxes we can reasonably expect to raise? History suggests that in the UK there may be an additional 5% GDP available, if the political will surfaces. Into this space we must fit not only UBS but also buttressing our existing services like the NHS, care and education as well as future costs already baked in such as a more elderly demographic and climate conscious adaptation. This is a crowded space! Maybe modern societies in the 21st century will have to enter uncharted territory in terms of total tax take just to transition to environmentally sustainable energy systems and take care of elderly populations, but then we cannot start with proposals that use up all that space to perform marginal cash redistributions. 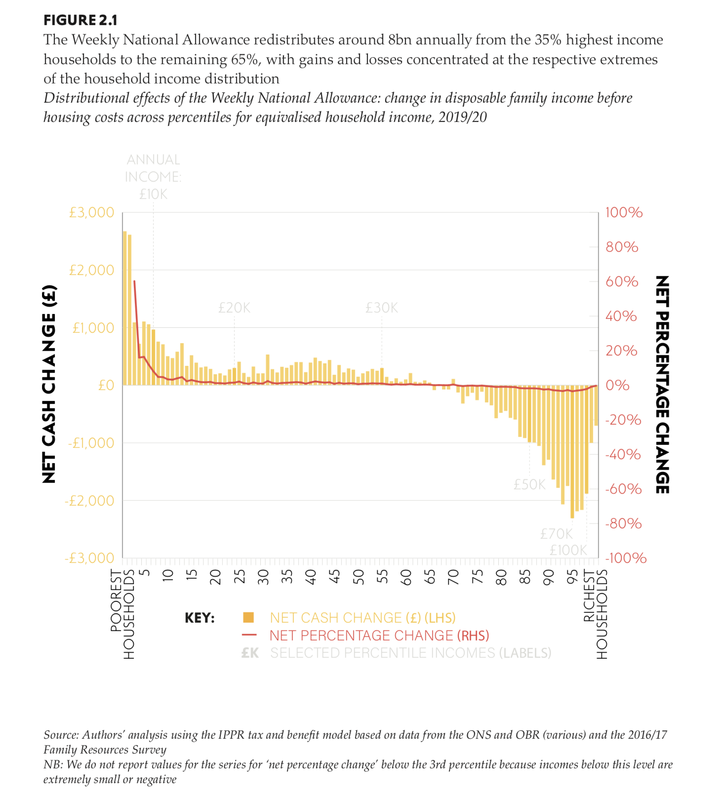 The NWA report would provide a net £50 a week to 2% of the population, and that’s said to lift 200,000 families out of poverty – but can we do better with a really vital 5% of GDP? When compared to the UBS report which housed 1,500,000, fed 8,000,000,000 meals and gave free transport to 65,000,000 for half the tax space (2.3% GDP), it looks like we could do a lot better. So why are people proposing to use tax increases to fund cash distributions when we would get more for our money if we used that to fund increases in basic public services? Because UBS is harder. Harder to describe, harder to model, and harder to do. UBS will require changes not just to taxes but also to configurations of social, political, and economic power. You can write a report that models taking away some money and then handing that money back out quite easily and it all fits in a spreadsheet. UBS doesn’t fit so easily in a spreadsheet because it is a simple concept but has embedded in it a complex and sophisticated evolution of democratic power, social security, and environmental responsibility. 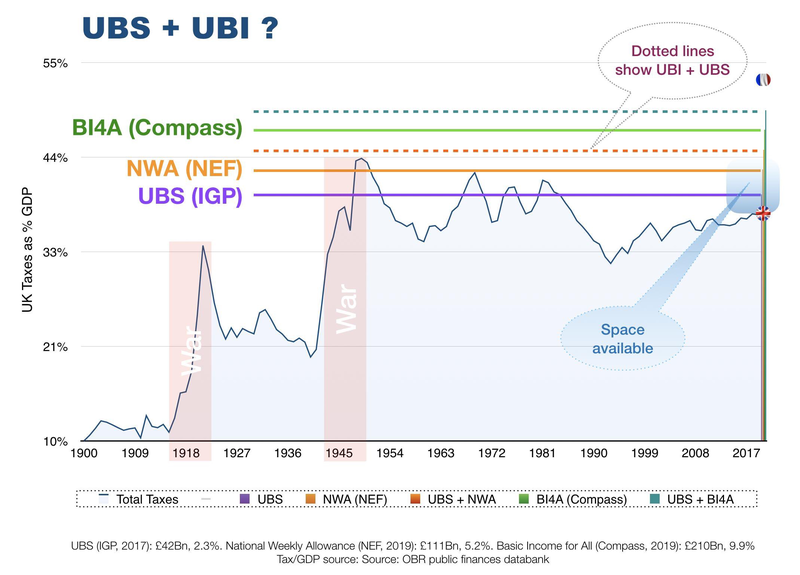 Can we have UBS and a UBI? Only on a spreadsheet. The real world will require us to solve our problems with more effort and less intellectualism, it will require that we roll up our sleeves and get stuck into the nitty gritty of actually building a better society, not just trying to model it. Excellent article – tho’ I do hope you know we spend and tax not tax and spend.